"The task of eradicating corruption has to be akin to a movement to conserve the moral order of human society. This movement has similar importance to the preservation of our natural environment to serve the interests of the men and women, who will replace us on this planet when we are gone. The generations to come deserve a better deal from us also in the moral order we leave behind as they do in the natural environment we are about to bequeath them." (Panday, 2001, p.14). Given the former statement's pertinence with regards to the Nepalese society, we owe it to the generations to come to do something about the terrible affliction corruption is. Anticorruption Movement Nepal believes that the best way of combating corruption is to inform the public about the nature and detrimental effects of corrupt activities, thereby raising the civil society's voice of discontent about such behaviours. Then, the government will be pressured into taking some concrete action an implementing an effective legislation. Many of the academics who discuss methods to reduce corruption talk about 'finding the root of corruption' in order to eliminate it. "Merely scratching the surface will not lead us to the desired results. The root should be traced and measures formulated for addressing it." (Lamsal, 2000). This view can be seen as profoundly over-simplistic and limiting, since we have already identified a vast number of causes and types of corruption. Clearly there is not only one single root whose killing would magically eradicate corruption for good. Therefore, the means by which corruption can be reduced must be as broad, dynamic, and diverse as the problem is. Changes in legislation, social attitudes and the culture/ values of those who are in a position to engage in corrupt activities are needed if a real difference is to be made. A recent initiative undertaken by the Commission for Investigation of Abuse of Authority (CIAA) shows very positive signs in this respect. The CIAA have started a cartoon-style poster campaign, encouraging Nepali people not to give bribes to corrupt officials. Anticorruption Movement Nepal perceives this method to be particularly effective in terms of 'low-level' corruption reduction, since it conveys a message to all those who happen to pass by the poster no matter their level of education. This is especially important in Nepal, where the rate of illiteracy is estimated at 46 percent. This form of anti-corruption campaigning is supported by the following quote : « Unless we tackle the problem on a broad front, the isolated and discrete attempts we might make will simply dissipate. » The 'business as usual' attitudes will get entrenched in various segments of society, prompting corruption and inhibiting good governance. Because it reaches large amounts of people, this CIAA initiative should therefore be more effective, especially if it is extended over a long period, and followed up by further poster campaigns. Another way of breaking the vicious circle of corrupt activities might be to pay officials a better wage. 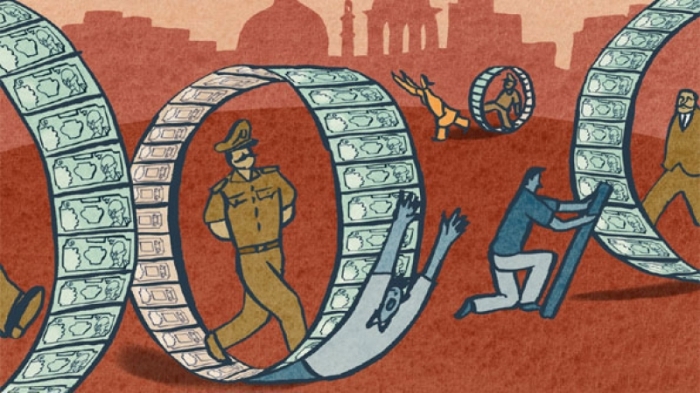 If public officials get a 'significantly higher' salary that enables them to comfortably support their families, their need to engage in rent-seeking activities would be eliminated. However, Anticorruption Movement Nepal realizes the limitations of this approach, primarily that a significant increase in civil servant wages may not be compatible with the country's budgetary capacities. More over, many may perceive this initiative to be actually rewarding the corrupt officials for their illegal conduct. Consequently, this method of controlling corruption could potentially reinforce it, provided that the officials perceive the increase in salary as a 'bonus' rather than its intended concept of being a contract (or carrot) offered to encourage them to refrain from their misconduct. As a conclusion, it is possible to curtail corrupt activities at all levels by 'cleaning-up' those who hold the highest positions of power, i.e. politicians and top level bureaucrats. In this way, if the 'top' is free of corruption it may 'lead by example' for the officials and people at lower levels of the social and political hierarchy to follow suit. "If the top is clean, open, transparent and accountable, one can expect quick impact on lower rungs. It is the political parties that should play the role model to transform the society." (Lamsal, 2000).